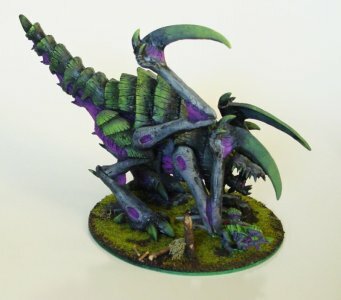 I've been playing Tyranids since the second edition together with my brother. We had a lot models. Most of them the old ugly ones (old Tyranids warriors anyone) and we've painted them in the old GW colors. That is red, purple and blue. 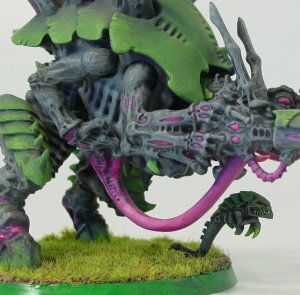 Some years later I slowly started to collect Tyranids again, just because I liked the new models and because I had constructed a big Tyranids bio construct. More about that in the articles section. This time I've don it better. The scheme is green and gray with some hightlights in pink. Carnifex with Barbed Strangler and Venom Cannon. A model like this can not be build right out of the box. Both heavy weapons are usually held in the right hand. I switched one weapon so that he's holding one on each side. Click on the picture to see my three Tyranid warriors. Actually I think that the main benefit is to act as Synapse creature. In the end the way I build them was quite good. 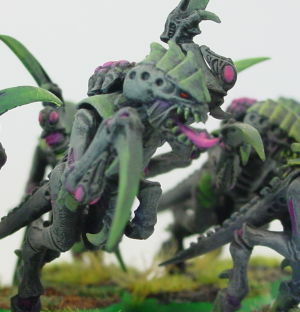 According to the new 40k rules the deathspitter and the barbed strangler don't need to-hit rolls. Quite convinient if you only have BS 2. My first group of Hormagaunts. I guess I will need some more before long.